The crimson edition of the Magnif'Eyes Edition Palette is gorgeous. Berries and their color coordinated tones are all the rage right now, going into from winter into spring and you will want to keep up the look as much as possible. With this palette you get 12 shades of berries and color coordinated shades to go with the berry shades. It also contains an applicator that is dual-ended with a brush and a puff, if you are say, out of the house and don't have any brushes for touch ups. The shadows are a mix of high-shimmer and matte shades, which are perfect for sculpting, shading and defining. These shadows provide rich, intense long-lasting color. They're crease-proof, smear-proof and wear all day long. 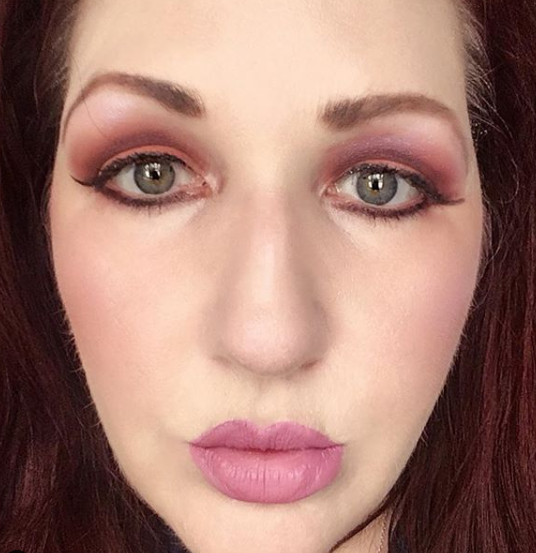 These shadows are definitely intense and go on beautifully. I like how they wear and how they make my green eyes look gorgeous. This is a nice palette for just about anyone. Yes, you can wear red eyeshadows. The Magnif'Eyes Crimson Edition Palette is available online at www.walmart.com, www.walgreens.com and www.amazon.com. They can also be purchased at any mass market drugstore that sells Rimmel London. Like Rimmel London on Facebook: https://www.facebook.com/RimmelLondonUS; Follow Rimmel London on Twitter: @Rimmellondonus; Subscribe to Rimmel London on YouTube: https://www.youtube.com/user/RimmelLondonUS; Follow Rimmel London on Pinterest: https://www.pinterest.com/rimmellondonus/; Follow Rimmel London on Tumblr: http://rimmellondonus.tumblr.com/ and Follow Rimmel London on Instagram: https://instagram.com/rimmellondonus/.